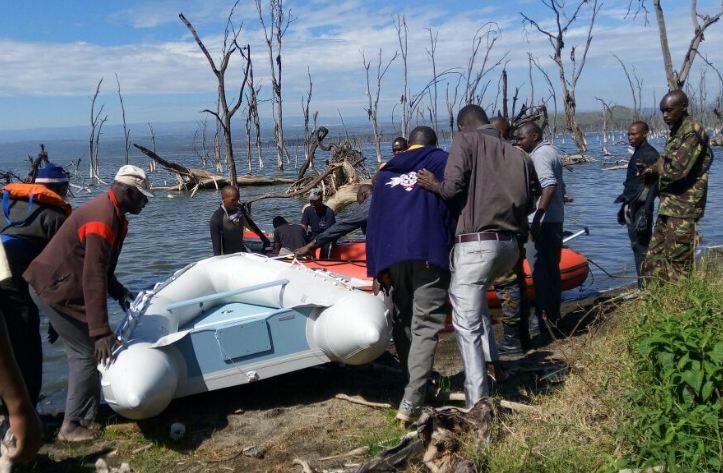 Helicopter crushes in Lake Nakuru killing 5 People, 3 of which belonged to Jubilee campaign team of Nakuru who were on Nakuru Tour Kenya. Victims of the crush are Anthony Kipyegon, Sammy Gitau, John Mapozi, Apollo Maloa (pilot) and a lady identified as Veronicah. By the time of going to press, the bodies of the five had not been recovered. The search was called off until today. Witness accounts show the crash happened few minutes after 6am after the pilot took off at Jarika County Lodge, at Freehold Estate in Nakuru town. According to multiple sources who talked to the The Sunday Standard, the five checked into Jarika County Lodge at 6am and boarded the helicopter which has been stationed at the hotel and flew off to an unknown destination. Information from hotel attendants indicate the four men who boarded the helicopter had booked rooms in the lodge on Friday evening. The four later left the lodge and headed to town. “They arrived here at around six in the evening and booked their rooms but left the lodge only to come back this morning in company of a woman,” said Micah Loperes an attendant at the hotel. Loperes said the four men never checked out and didn’t have their breakfast either. The chopper took off few minutes after 6am with the five aboard and the attendants said they saw it go round twice round Nakuru Town before it disappeared. It is also believed the victims including the pilot appeared drunk when they arrived at the lodge that fateful morning. when interviewed, Waiters at the Platinum 7D Club, said the four checked into the club in a large group at around 1am and they appeared to be club-hopping around town. “I had a brief chat with the pilot who was seated at the counter. He was drinking beer and appeared drunk. I called his friends to take him away to rest. He could not walk on his own and his friends had to hold him. They left the club at 5:30am,” a waiter said.